I like to move around, and that is why I'm acutely aware of the importance of the sine qua non of my locomotion: my feet. I have difficult feet: very difficult feet. Between the broadness inherited from my dad, and the bunions inherited from my mom, finding a pair of shoes that fit is a major triumph. If the shoes don't fit well, my feet will tell me so, without much subtlety. Perhaps that's why I'm also acutely aware of the sine qua non of my automotive conveyance: the wheels of my car. Your car can have the smoothest-running purring engine: you'll still get nowhere without a set of wheels that are in good shape. Hence my fixation with tire pressure, and keeping the rims circular. See this widget? It's a hoof pick. You can get it for less than $2 at any equine supply store. It has a strong rounded point on one side, that you use to pry stones and other sharpies out of the horse's hoof, then you can flip it over and brush off the remaining dirt. We don't have horses. But we do have a few mud bunnies who tend to pick up the most amazing crud on the bottom of our shoes. 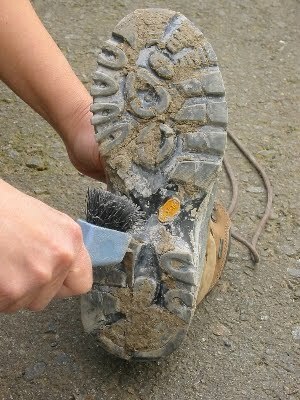 City shoes are easy to clean, but for the boots with treads those hoof picks come in real handy. Turns out they're the perfect tool for prying gravel out of tire treads. Treads on new tires can be up to 1/4" deep, and that much rubber can really get a grip on small pebbles and gravel. 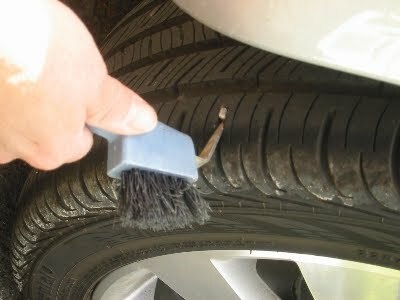 Some of those stones have sharp edges, so to be gentle on the tires I like to pry them out, pre-emptively. That also stops the annoying tick-tick you hear at every revolution of the wheel as the protruding part of the stone hits the alphalt. On a recent fossil-hunting trip, when we drove into a few gravelly quarries, trudged our boots through clay-bottom streams, and brushed dirt off the fossils, we used that hoof pick constantly. I love a multi-purpose tool.